Recognized for sophisticated elegance and timeless designs. Coach is a modern American luxury brand with a rich heritage rooted in quality and craftsmanship. The designer eyeglasses blends iconic signature details with modern materials in a distinctive selection of optical and sunwear designs with authentic New York style. Coach was founded in New York City in 1941 as a family run workshop. Leather products was their niche. This is what set them apart from other luxury brands and continue to set them apart today. The stores stretch across 5 continents and have over 1,000 locations. 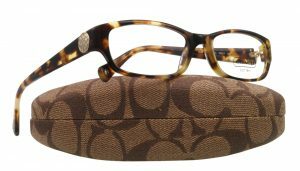 The Coach collection is available at Good Looks Eyewear. Visit our Pittsburgh or Cranberry Township location to pick up your glasses or sunglasses.